Speaking to children is much different than speaking to adults. An adult usually has the self-control to sit and listen, even when not interested. A child, no matter the age, does not possess that same skill. They may be able to sit for a few minutes, but if they aren’t interested, you will soon know it. If you find yourself presented with the opportunity to teach children, whether in a classroom, a library, a small group, a ministry, a Sunday School, or you name the setting, there are a few things I have learned over the years that could be beneficial and help you improve your teaching. It is important to remember that everyone learns differently. The fact is most of us will teach the way that we learn best. The problem with that is there will always be kids you are dealing with who learn differently. If you are not prepared to vary your methods, you can be sure you will lose many of them. And we all know what happens once a child is no longer interested. Let the discipline issues begin! There are lots more tips and tricks you could employ, but here are 4 that will help take your teaching or story telling to a new level. There are kids that are visual learners. They learn by what they see. Use props when you teach or speak. Give the kids something to look at other than you. I am sure you think you can be interesting enough, but they see you all the time. Do an object lesson or an experiment to help make your point. Use a costume. Show a photo. Give them something else to look at. Even kids who are not visual learners will pay better attention when there are cool things to look at. Do your best to engage the eyes. One trick I am sure most of you know is to vary the volume of your voice. I have found that when kids start to ‘check out’ and talk among themselves and not pay attention, that is a good time to lower your voice and make it harder to hear you. Often those kids listening will tell the loud kids to be quiet so everyone can hear. Or the kids that are not paying attention will stop and try to listen, because it gets their attention because you are quieter. It works the other way as well. Don’t be afraid to get loud, or even yell. Especially when there is an exciting part in your story. Be excited! I have startled many kids with a well-timed yell during teaching time. It definitely works to get everyone’s attention. Be sure to engage the ears. 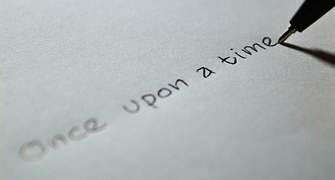 your story as you tell it. Ask questions and have them move to different parts of the room based on what they think the answer is. Find a way to add some movement into your lesson or story. Remember movement often assists learning, so engage the body. You are teaching or telling stories for the sake of having the kids learn. To help solidify the concepts or ideas you are teaching, be sure to ask questions. Have them retell part of the story in their own words. Ask open-ended questions that make them think instead of just recite what they heard. Be sure to engage their mind. Like I said, there are many other things you can do to become a better teacher or story-teller. This is just a short list of things everyone can do to become better. Our goal is the same–to help kids learn. When we remember that kids learn different, we can change our teaching strategy to be more effective in reaching those different learning styles. Not only will this help you become a better teacher, and help kids learn, you will also reduce the behavior issues. When kids are actively listening and learning, they are less likely to act up. Not only are you being a better teacher or telling a better story, you are stopping many behavior issues that result from simple boredom. What do you think? Could you share a time you made use of one or more of these strategies? What steps ahve you taken to improve your teaching? Or what do you do that I didn’t mention? Leave a comment and help someone else teach better because of your experience! Be the first to comment on "4 steps to better teaching and storytelling"